Week 83 – Where I’ve been…. Good morning. It’s been a while! I knew I hadn’t updated my blog for a time, but until I sat down to work on it today I didn’t realize it has been 5 weeks. My last update was on August 21. Since then, much has happened. First, on the weight front, I have lost 4.4 pounds in those 5 weeks. I am now down a total of 132.4 pounds (including 0.8 this week), or 38.4% of my original weight. 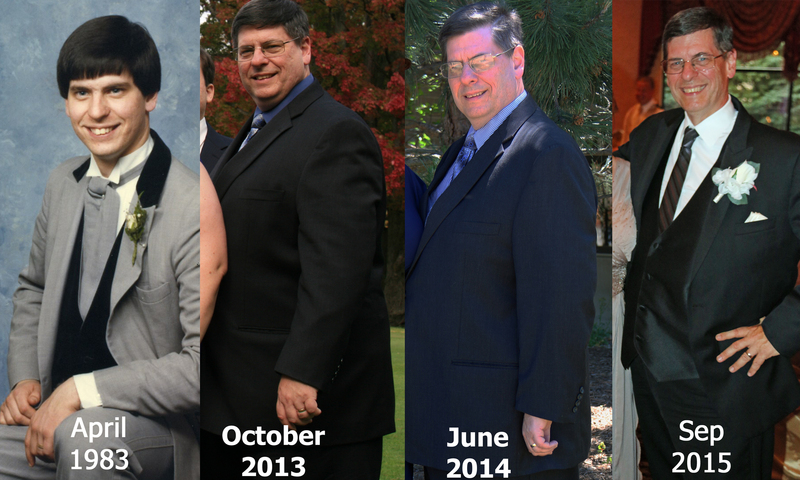 You can see my full progress graph on my Weight Loss Chart Page. A lot of other things have been going on in my life in that time as well. My youngest son got married on Lao=bor Day weekend. Honestly, the busyness of getting ready for the wedding was the original reason I slacked on updates here. Since then my wife and I have been decompressing a bit, including a camping trip last weekend. We’re going on a large, multi-family trip starting this afternoon as well. I call it the tale of 4 weddings. It starts with my wedding way back in 1983, and then picks up in 2013. For that wedding in 2013 I was close to the heaviest I have ever weighed. That was 5 months before I began this journey. June 2014 was my nephew’s wedding, when I was just about 300 pounds. For my son’s wedding I weighed in at 214.8, or down just over 130 pounds. I am not completely sure what I weighed back in April 1983, but I am fairly certain it was less than what I weigh now. I am not going to make any promises here about weekly, or even more frequent updates. I hope to be writing more frequently, and I want to do more than just show my progress chart weekly. I also know that promising to make updates on a blog is a good way to have a dormant blog whose last update was a promise. Someone commented to me that I am missed here in the blog world. I will tell you that I have missed this as well. As I can in the coming days I plan to scan through and read the progress of my friends here as well. For the week ahead my plan is to do what I do. I will track my food, get to the gym, and walk whenever I can. I hope you all have a great week! First off, heartiest congratulations on your son’s wedding. You being busy makes a whole lot of sense. Secondly, you look amazing. So good to see that you have retained your smile through all the highs and lows of life.Literally! Thank you for this filler post. It boosted up my otherwise dreary Friday evening. Cannot wait to hear from you as and when time permits! The pictures say it all. Congratulations!